Protect your landscaping equipment with the Ready Rail® Landscaping Toolbox. 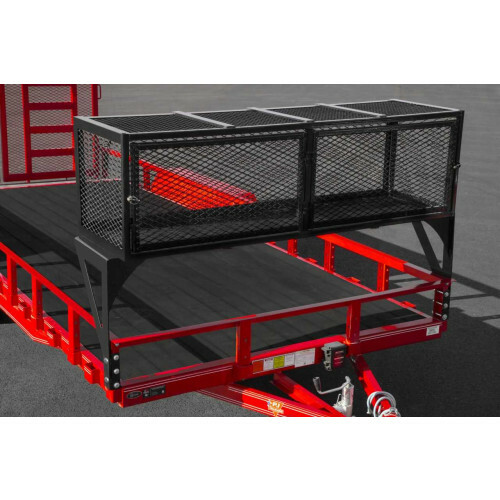 This locking toolbox (locks not included) installs easily with the included brackets and hardware to the front of PJ utility trailers ranging from 60”-83” in width. It’s an ideal solution for keeping your more delicate landscaping tools safe on the road and protected in storage. The doors on the Ready Rail® Landscaping Toolbox can be positioned to open either to the front or the rear. Sides are constructed from sturdy 11-gauge expanded metal, and the floor is 12-gauge sheet steel to prevent items from falling through. Uprights are formed from 1/4" steel plating for extra durability, and bolt directly to the sides of Ready Rail® equipped PJ utility trailers. Ready Rail Landscape Toolbox are not compatible with Utility Trailers that have Side Mount ATV Ramps Rails installed on the trailer. If I had an 83" wide trailer, what is the maximum depth (front to back) is the landscape tool box? We would like to fit back pack blowers inside box. Are custom sizes available for different tool box configurations? Are landscape tool boxes available on sides of trailer? I'm looking at buying to 83" by 22' PJ Utility trailers with tandem axels. Please reply. Thank you! At this time this is the only Landscape toolbox compatible with the ready rail system. The inside dimensions are 24" X 24". What is the measurements on the ready rail landscape toolbox,83" trailer? The box itself 82" X 24" X 24" outside. 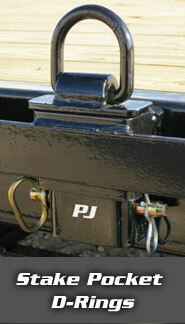 The brackets are adjustable to work with any PJ Ready Rail equipped trailer from 60" - 83" wide. On the smaller trailers the box will hang out past the side rails. 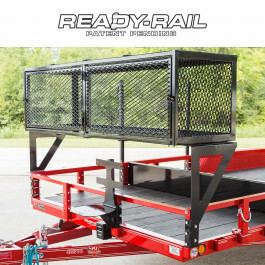 Would buying this tool box system work for my fixed rail at the front of the trailer and somehow modifying it by adding sheet metal or wood to parallel as a nose guard? I don't necessarily need the tool box portion but the brackets got me thinking of the possibility. This would not work for that application and we actually do not offer what you are asking for. You will have to get someone to fab a piece of sheet metal to meet your needs.